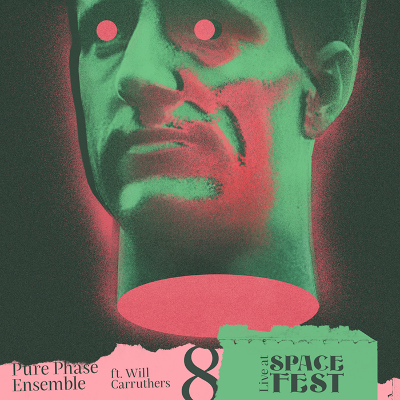 Pure Phase Ensemble 8 ft Will Carruthers - Live at SpaceFest can land on your table sooner than you expect! The cover artwork was designed by amazing Patryk Hardziej (Hardziej Studio). The music was created by: Will Carruthers, Karol Schwarz, Hanna Went, Marysia Białota, Wojtek Grabarz, Seb Der Strychen, Marta Sap, Jasiek Nawacki, Adam Naubauer & an unexpected special guest Piotrek Kolendo. Here’s day 2 line-up: EYRE LLEW, Popsysze, The Lucid Dream, Columbus Duo, Pure Phase Ensemble ft. Will Carruthers, XDZVØNX, SPOIWO. This magic event wouldn’t be possible without these people: Ania SZynwelska ❤ i niezastąpiona ekipa: Ewa Fuunia Chudecka, Ania Wieruszewska, Maciej Komis, Karol Schwarz, Mortyszja Dear, Paweł Jóźwiak oraz Państwo: Ola Szkudłapska i Błażej Szkudłapski. Kudos to our great team of volunteers: Aleksandra Józefiak, Mat Menegon, Małgorzata Sawicz, Maja Makowska, Natalia Bajan,Ewelina Kosater, Paulina Sidoruk, Kacper Kotlęga. Ladies and Gentlemen, this spaceship has taken off! Pin Park, RAKTA, Dr Switchoff. We’re also heartbroken because their SpaceFest concert is among the cancelled ones. 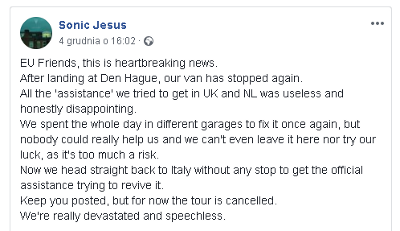 We’re sorry to communicate it as we were also looking forward to their gig. Hopefully, next year we’ll have more luck and invite them again. 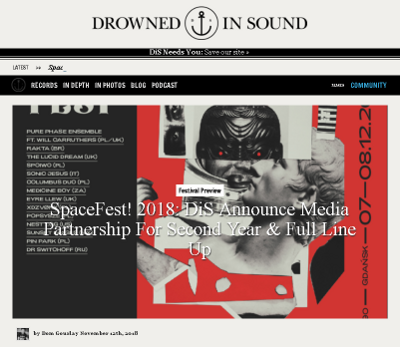 And in the meantime we’re looking for another band to step in and play a gig on 7 Dec.
Our media partner Drowned in Sound announces we keep up cooperation on SpaceFest for second year and presents the festival line-up. The article and festival guide prepared by Dom Gourlay. 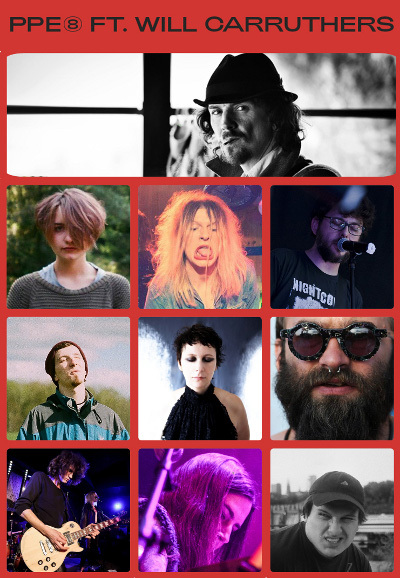 Will Carruthers (Spacemen 3, Spiritualized, kierownik artystyczny, bas), Adam Neubauer (Pedal Distorsionador, gitara elektryczna), Hanna Went (Free Games For May, gitara elektryczna, wokal), Jakub Żwirełło (Wczasy, syntezatory, gitara), Jasiek Nawacki (Masło, congi, djembe, perkusjonalia), Marysia Białota (Signal to Noise Ratio, syntezatory analogowe), Marta Sap (didgeridoo, drumla, cytra), Seb Der Strychen (Oil Stains, perkusja), Wojtek Grabarz (Pedal Distorsionador, wokal, gitara, syntezator), Karol Schwarz (Karol Schwarz All Stars, gitara, wokal, kurator projektu), Ania SZynwelska (kuratorka, SpaceFest queen;). 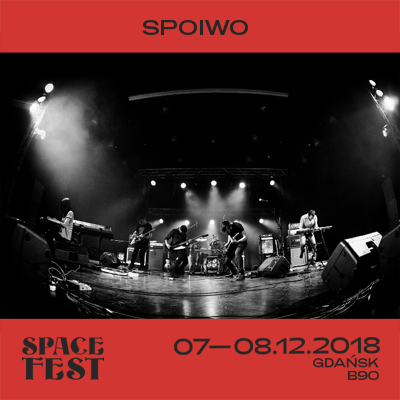 Jest nas dużo, ale jeśli ktoś z Was gra na instrumentach dętych i chciałby się przyłączyć, to niech szybko pisze na love@spacefest.pl. Może rzutem na taśmę uda się jeszcze wejść do składu! 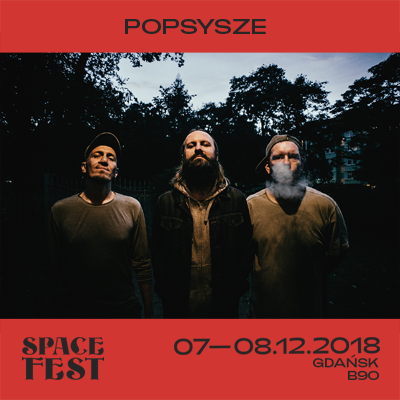 Popsysze (Nasiono Records) played at SpaceFest during the first editions accompanying such artists as Damo Suzuki or Lætitia Sadier, and this time they they will play their own material inspired by wild and mysterious nature. We’ll see what gods of Kashubian psychedelia will send us! 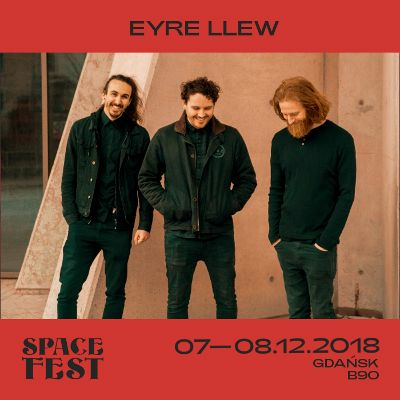 EYRE LLEW are conquering Asia a the moment but in December they will play in Gdansk at SpaceFest. We’re in for a treat of beautiful, ethereal sounds. If you’re fans of bands such as Sigur Rós or Mogwaii, this concert will move you deeply. Monday announcements time! 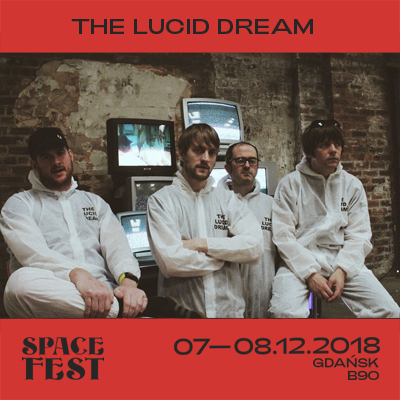 Today we have The Lucid Dream for you – one of the most enthralling bands of the UK psych scene who like to merge genres so you can expect a mind-blowing mixture of psych with elements of acid house, dub and kosmische during their performance at SpaceFest. They are ace live! 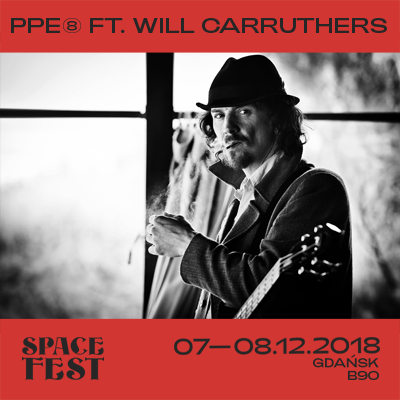 We’re happy to announce that the 2018 edition of Pure Phase Ensemble will be curated by Will Carruthers who has played in 33 bands over thirty years, perhaps most notably in Spacemen3, Spiritualized, Spectrum, The Brian Jonestown Massacre, and Dead Skeletons. 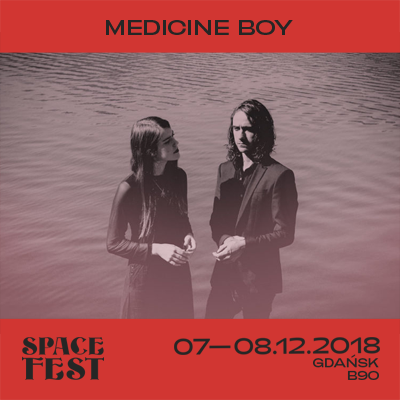 The effects of the band’s work will be presented live on 8 December on the SpaceFest! stage at B90 club. The entire set will be recorded and released on CD in 2019. And traditionally, we invite musicians from Poland and abroad to join Pure Phase Ensemble. If you want to play with us, please send us your application form. You can find more details in the “rules of the game” document attached below. We’re waiting for your applications till 15 Oct 2018. Here are the results of the competition. SpaceFest! 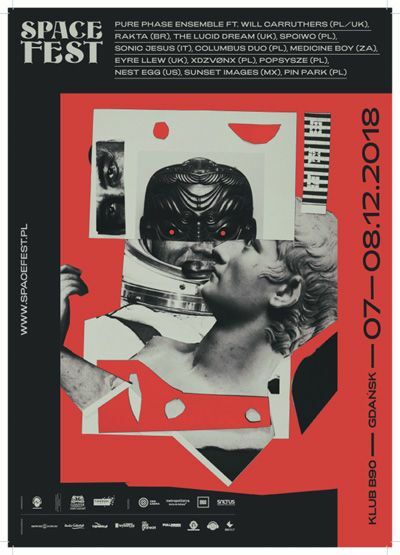 2018 line-up will be joined by Columbus Duo from Gdańsk (noise, minimal, drone, ambient, improv duo), XDZVØNX from Wroclaw (sacral noize/dark electro – weird psych experimental sounds). Special mention: Sunset Images from Mexico (guitar psych, experimental noize with shoegaze elements). It’s going to be massive and hypnotizing (and sometimes strange)! Attention! Here’s the next band to join our line-up! 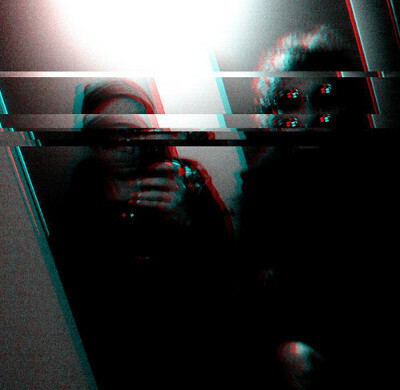 Ladies and gentlemen, please welcome Medicine Boy – a Dream Noise duo from Cape Town, South Africa. Influenced by the likes of Rowland S. Howard, Spiritualized, The Mary Chain and The Bad Seeds. Medicine Boy has just signed to Fuzz Club records, who will release their next album in the Autumn of this year.